People nowadays are using more and more mobile devices and that too not only for browsing the web. As a business, if you want to interact with the mobile customers, you’ll need mobile apps that provide interaction, value and feedbacks. The smartphone Apps have changed the definition of everyday activity in human life. It has been an essential part of our lives and why not? We do almost everything with the help an app. The world is connected with mobile apps. It is crystal clear that the demand of mobile apps has escalated in all businesses. To cope with that, we become your accelerator to design and develop brilliant mobile applications. 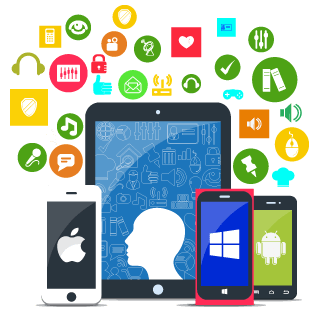 Markup Destination is a top-notch mobile app development company offering mobile application development services for iPhone, iPad and Android. At Markup Destination, no technology is left untouched. We believe in adopting trends that change with time and user demands. Be it iOS/Android wearables, AR/VR apps, Internet of Things (IOT), Beacons - we’ve worked with infinite possibilities in mobile application development. Among all the other mobile application development companies, what sets us apart is the end-to-end solution to create a unique mobile experience across multiple platforms, devices and OS versions, with continued support and maintenance to respond to your short-term and long-term needs. Markup Destination is the trusted mobile app development company offering mobile application development services for iPhone, iPad and Android. We offer end-to-end solution to create a unique mobile experience across multiple platforms, devices and OS versions. Our clients love us for the continued support and maintenance we offer to respond to their short-term and long-term needs. At Markup Destination, we have helped the following businesses with their demand for a mobile application. If your businesses is not included in this list, chances are that we are building something for you already.